Featured Chapter: The Pressure To Obey: What Would You Do? This book will flow among different levels of our lives—our work lives, our education lives, our home lives, back to our work lives. Understanding appropriate obedience and Intelligent Disobedience at each level will reinforce our capacity to create the right balance between these at the other levels. Throughout the journey, the image of the guide dog will accompany us, utterly devoted to obeying when doing so serves the common good and to disobeying when doing so prevents avoidable harm. We will look closely at the “secret sauce” that goes into guide dog training and distill what of this can be transferred to human development and cultural change. French philosopher Paul Ricoeur introduced the concept of the “servile will” in The Symbolism of Evil, (1960). The servile will is the will that makes itself a slave to authority. It diminishes human nature. Such a mental state, although seemingly extreme, is more commonplace than we would like to believe. There is a sense of freedom liberating oneself from a will that is enslaved. From our earliest socialization, we are rewarded for obeying all authorities: parents, teachers, religious leaders, politicians, and more. Nowhere in our educational system, or even our social system of values, is there training in appropriate disobedience or simply to distinguish between obedience to just authority and defying unjust authority. In our private and public institutions, we see perennial catastrophic results of this failure among adults who should know better, but conform, comply, and obey anyone who conveys a sense of authority. In the schooling of our young, we see patterns of obedience being formed that lead to misplaced obedience when they become the adults in those institutions. Where do we turn to for fresh answers to striking the right balance between obedience to authority and independent choice? We can turn to two places. First we turn to traditional social sciences for research-based answers and maybe solutions. Then we turn in a totally new direction, to be revealed to you in this remarkable book, about what we can learn from the training of trusted guide dogs who are taught what is called Intelligent Disobedience. It is has been a half century since the great social science experiments on authority and obedience, first by Stanley Milgram at Yale University in the 1960s, then followed by my Stanford Prison Experiment in the early 1970s. Milgram’s work revealed that among ordinary citizens, two-thirds were willing to deliver painful shocks at the insistence of an authority who was a stranger to them. The good news in that research program was that when participants observed people like themselves refusing to deliver the painful shocks, then 90 percent of them refused. That means we are prone to obey authority, but also affected by the behavior of our peers. Thus we are all social role models, and what we do—for good or for bad—has a ripple effect when other people observe us. My research at Stanford University extended the Milgram paradigm away from a single authority issuing commands to having participants embedded in a social context where the power resided in the situation. Normal, healthy college students, randomly assigned roles of prisoner or guard, lived in a simulated prison setting—prisoners did so day and night, the guards for eight-hour shifts. We intended the study to run for two weeks but had to terminate it after six days because it had run out of control. Our goal was to create the mindset in these college student participants that they were real prisoners and real guards in a real prison. That goal was accomplished far beyond what I could imagine when we began. In the contest between good people and evil situation, humanity lost and the situation won. Put differently, the dispositions of the individuals predicted nothing about how they behaved in either condition when overwhelmed by a powerful, novel social setting. Even I was caught up in the power of that situation by mistakenly playing dual roles of principal investigator and prison superintendent. In the latter role, I became indifferent to the suffering of these young men, allowing the guard abuse that emerged to continue much longer than it should have. The takeaway message from this study is that human behavior is more under the control of situational influences than we want to believe, as we continue to cherish the concept of freedom of the will and inner determination of our behavior. More recently, I have been conducting research in the Netherlands and Sicily, with my colleague Piero Bocchiaro, to illuminate the conditions that can lead to disobedience to unjust authority. We introduce the concept of productive disobedience, an act of peaceful noncompliance with laws or norms or the demands of authority that, if followed, would hinder the moral progress of society. What happens when a scenario is described to college students that clearly depicts an authority figure making unethical and unjust demands on student participants, and they describe how they would react? The vast majority report they would rebel; however, when their classmates are actually put into that very same situation, just the opposite occurs—more than 80 percent blindly obey! This again reveals the power of situational norms to dominate moral reasoning. Our only bright light was discovering that those high on the antiauthoritarian personality trait were best able to be defiant. We found disobedience could be enhanced when in the presence of student rebels and when obedience had a high personal cost. The overall high rate of obedience to authority was, however, distressingly high. Despite my proselytizing these messages for many years, humanity is no closer to having absorbed the lessons of these experiments than it was before they were made part of our social consciousness. In our private and public institutions, we still see perennial catastrophic results of this failure among adults who should know better. It is evident in the schooling of our young where we see patterns of rigid obedience being formed from day one by teachers and officials. This leads, in turn, to misplaced obedience when these students become the adults and taxpayers supporting those institutions. Nowhere is there any attempt to teach the fundamental difference between just and unjust authority, the former earning our respect, the latter justifying disobedience and rebellion. Where do we turn to for fresh answers for striking the right balance between rigid, mindless obedience to authority and independent choice? Our society gives lip service to creating independent thinkers as a primary result of all education. But so far, there is not much to show for the success of that ideal. I was surprised to discover the answers I was seeking in this remarkable book by Ira Chaleff. He offers us a metaphor and an effective model from “man’s best friend.” It is clear that we painstakingly teach guide dogs how to discern between when to obey and when to resist in order to avoid causing harm if given dangerous commands. Surely, we can do the same in the acculturation of our young and the development of our professionals in the highly sensitive roles that our society gives them to make things run properly. Whether training teachers for classroom management, guards for the security roles that have become ubiquitous, or information specialists who control our privacy and the protection of our identity, it is crucial to develop new ways of distinguishing between appropriate obedience and rightful disobedience. Reading this remarkable book has given me new hope for the prospect of humanity finally learning the overdue lessons needed to cope effectively with the many urgent challenges of our times. I do hope that you, dear reader, will also learn and apply the vital messages contained in Intelligent Disobedience. It is our communal responsibility to see that its lessons will be taught in relevant ways at every stage of human and professional development—to our youth, as well as to our social, religious, business, and political leaders. I was surprised to discover the answers I was seeking in this remarkable book by Ira Chaleff. He offers us a metaphor and an effective model from “man’s best friend.” It is clear that we painstakingly teach guide dogs how to discern between when to obey and when to resist in order to avoid causing harm if given dangerous commands. Surely, we can do the same in the acculturation of our young and the development of our professionals in the highly sensitive roles that our society gives them to make things run properly. I WAS TEACHING A CLASS on courageous followership to a group of doctoral candidates at a Methodist university. Courageous followership is a way of being in relation to leaders. It requires giving those in leadership roles genuine support and building relationships with them that will allow those in follower roles to speak candidly when needed to prevent or correct leadership failures. It was a great class with lots of lively, engaged dialogue. During a break, one of the students came up to me and told a story that made a deep impression on me. This story happened twenty years prior to our conversation. The need for Intelligent Disobedience can arise suddenly and demand a high order of poise to respond appropriately within the compressed time the situation demands. We must give our own perceptions, training, and values equal validity to the perspectives of those in authority when weighing the right course of action. There are often options other than “obey” or “disobey” that can lead to better outcomes. If we take a deep breath and pause to think, we may be able to offer alternative creative responses that satisfy the authority and better meet the need of the situation. I met the author Ira Chaleff at a local author event shortly after he had moved into our area. Ira is a leader in a necessary area of business ethics: followership. We always hear about the need for leadership, and the training of good leaders, but very few people think of the importance of good followers or of being a good follower. I consider myself a student of human nature by virtue of my primary occupation of fiction writing and editing. In order to create fascinating characters, one must be fascinated by humanity. An important part of studying humanity is studying how we relate in group settings, and that has led me to have an abiding interest in sociology. So when I first heard Ira discourse on the importance of follower-leader interactions I was intrigued, and I was excited to get a copy of his landmark book, The Courageous Follower. I knew he was working on a new book, and I knew I would read it, but I was unprepared for how engaging, provoking, and inspiring this book, Intelligent Disobedience: Doing Right When What You’re Told Is Wrong, would be. The term “Intelligent Disobedience” is used in guide-dog training: dogs who are trained companions to disabled people. When I was a little girl, we had a family friend, Bertha, who was blind, and whose constant companion was a black lab dog, a patient, gentle animal, who was always at her side, listening for Bertha’s commands, but wise enough to disobey when needed. Bertha had told us how the dog was not only a guide, but a protector as well: he would stop her from walking into a busy street or from hitting her head on a low obstacle. I don’t know if I ever saw the dog’s “intelligent disobedience” in action, but it impressed me profoundly that this dog was not only smart enough to obey, but smart enough to disobey. How does this play out in human relationships? Most of us spend our social lives as part of some kind of hierarchy, however informal: we are employed, we are church members, we are club members, political party members: in our personal lives, we are students of teachers, children of parents, and so on. Part of being an adult is learning to be a good team player, to be able to take on a job or responsibility, to be able to be accountable. There’s a lot of conscious and unconscious pressure, especially at school and at work, to learn to obey, to be obedient. While we Americans always pay lip service to the rebel, especially in our entertainment, most of us learn that rebelling in most situations is unproductive and even destructive. When we experience a conflict, especially in personal relationships, we might feel like we have only two choices: obey without question or rebel and lose everything. But how often do we learn how to disobey intelligently? While Chaleff praises thoughtful civil disobedience, he makes it clear that intelligent disobedience is different. It’s a wise way of working within the system to preserve the values the institution is based on while opposing a specific command or practice that contradicts those values. The most riveting part of the book was the true life stories. The young emergency room nurse who was directed to give a patient a medication that she knew was dangerous. The lieutenant who was asked to cover up a military base violation. The teacher who found a fellow teacher had duct-taped a student to a chair. The McDonald’s manager who was told to strip-search an employee. Sometimes inspiring and sometimes disturbing, these stories act as templates for how to act–and how not to act–in difficult situations. Most of us have heard of the famous Milgram experiment in the 1960s where participants were asked to administer a possibly dangerous electric shock to test participants. Nearly 75% of participants did as they were told, even when they knew it was wrong. Chaleff revisits this experiment to find out something more important: under what conditions did participants disobey the orders? What factors encouraged more intelligent disobedience? As in his other book, the highly-recommended The Courageous Follower, Chaleff acknowledges the role of belief in higher values and authority (ie: religion) to help a person wisely obey an errant authority. His ability to depict the nuances of ethical behavior is, as in the other book, spot on, making this book an important resource for believers who find themselves in the position of management or employee, in institutions both religious and secular. In a world where business ethics books either neglect or dismiss the role of religious belief, this inclusion is a breath of fresh air. He also issues a call for educators to examine how they can train their students not just to learn to obey, but how to discern when disobedience is the higher call. Those who are striving to recover true liberal education (education that liberates) in schools should read this book. Montessori educators and Responsive Classroom theorists would find affirmation in some of their approaches. Classical educators and off-the-beaten-path educators and homeschoolers will find a book they will want to read aloud to their teenagers and absorb into their curriculum. At least, that’s what I experienced! Intelligent Disobedience is a must-read for anyone who recognizes the paradoxical quality of loyalty: that sometimes the best thing you can do for the authorities in your life is to oppose them. Wisely. Creatively. And loyally. Read it to your teenagers. Read it to your fellow teachers. Share it with your organization. Author of Fairy Tale Novels, the picture book Angel in the Waters and several graphic novels, the last beign Pope Francis I: I believe in Mercy. Intelligent disobedience is a core competency for doing the right thing when pressure is exerted to do otherwise. This book provides an overlooked and essential element of ethical decision making and right action. While only a few of us may become whistleblowers, all of us have the responsibility to stand up for doing the right thing. «Intelligent Disobedience» offers the tools for doing this effectively in virtually any setting and at any age. Intelligent disobedience includes the ability to be heard when we say “No.” Learning this skill is an elusive key for living abundantly and reading this book will give you the key. It will be of even greater value to parents and teachers entrusted with developing personal accountability in today’s students and tomorrow’s responsible citizens. This powerfully written book engages the reader from the moment they begin to read it. History has proven that people usually follow orders regardless of their sense of right and wrong. Nazi Germany is certainly one of the most glaring examples, yet, unfortunately, we still have not learned from history. Ira Chaleff brings the power of this lesson home with his meaningful examples and engaging writing. This book is illustrated with examples from such varied subject matters as Health Care, Transportation, Energy, Finance, Education, the Military and more. Everyone will find the information both informative and relevant. As an educator, parent and grandparent, I found Chaleff’s focus on how to support our children in developing the skills of intelligent disobedience to be extremely insightful and helpful. At the end of each chapter, Chaleff highlights the key ideas that were presented to reinforce the concepts. I highly recommend this book for leaders, educators, parents… In fact, just about everyone would benefit from a better understanding of the concepts presented. 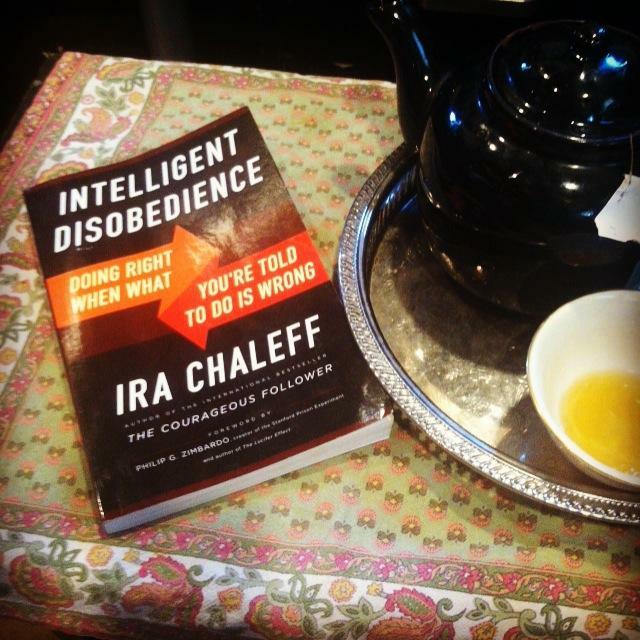 I have much to say having finished your new book on «Intelligent Disobedience». It is a wonderful piece, perhaps the only book I have ever read that gave me hope that reading a book can begin a process of behavioral change. Congratulations on the book, its contents, tone, combination of humility and audacity, voice and aspiration. Chaleff’s «Intelligent Disobedience» proposes that individuals find a healthy balance for living in a system with rules and authorities while taking responsibility for their actions. The author uses examples from government agencies, hospitals, the armed services, and corporations to demonstrate how “just following orders” can be taken to an extreme, causing harm to others. He turns his attention to helping readers deflect commands they deem wrong and ultimately create a culture that does the right thing. VERDICT: Thought provoking, stimulating, and ideal for discussion groups. Berrett-Koehler publications are available through most bookstores. They can also be ordered directly from Berrett-Koehler online, or by phone (800) 929-2929 or Fax (802) 864-7626. Quantity sales: Special discounts are available on quantity purchases by corporations, associations, and others. For details, contact the “Special Sales Department” at the Berrett-Koehler address above. Orders for college textbook/course adoption use: Please contact Berrett-Koehler: Tel: (800) 929-2929; Fax: (802) 864-7626.
or visit http://www.ingramcontent.com for details about electronic ordering.